No matter the time of year, whenever you want to prepare a tasty snack for you, or your family, there’s not much that can beat yummy waffles or delicious pancakes. Much of the fun is in making them and having a batter dispenser that helps, rather than hinders, is a must. In these reviews, we are going to look at five of the very best waffle and pancake batter dispensers, and give you the lowdown on how they will help you cook up a perfect treat every time. 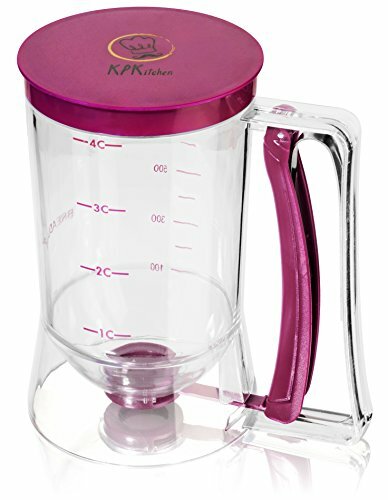 Being able to control portion sizes without creating a mess is one of the primary reasons to use a batter dispenser and this offering from KP Kitchen will help you to do exactly that. 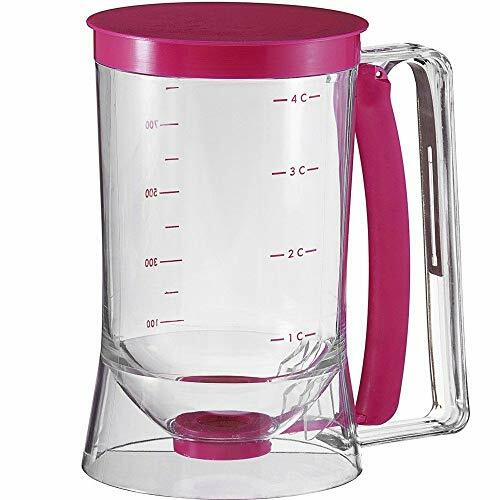 Getting the right amount of mixture to start with can often be guesswork with dispensers or jugs that have no markings. 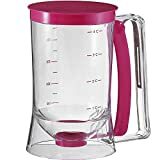 That is not a problem with this dispenser as it has easy to read measurements on the sides in both cups and milliliters. The dispenser has a capacity of four cups, so you can fill it with enough mixture to make plenty of cupcakes, waffles and pancakes. Dispensing your mixture could not be easier. Simply squeeze the pulley handle until the amount of mixture you need is dispensed. When you release the handle, the mixture will immediately stop pouring, so there is no mess or spillage. The dispenser is made of durable, high quality and 100% BPA free plastic so it should be around for years helping you to help you make pancakes and waffles, plus it is extremely easy to clean. Simply wash with warm, soapy water, then rinse, and it’s ready for the next time you want to use it. A great bonus is the free recipe book which contains recipes for cupcakes and pancakes. This is a simple and effective dispenser which helps you to pour perfect portions and does so without creating a mess. 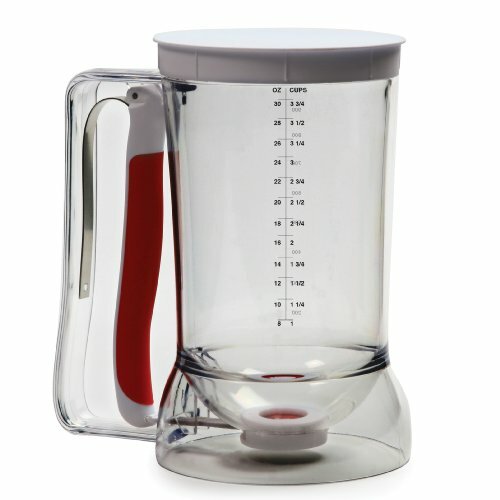 The capacity of the Norpro batter dispenser is 4 cups, 1 liter, or 32 fluid ounces, depending on which way you prefer to measure. Whichever it is, you have enough capacity to make a decent serving of waffles, pancakes and cupcakes. 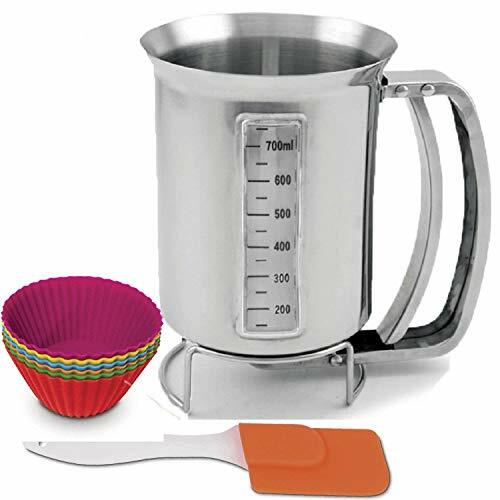 As there are measurements on the sides, you can use this dispenser to mix your batter or mixture. The units are clearly marked from 1 cup up to 4 cups, from 8 fluid ounces up to 32 fluid ounces and from 200 milliliters to 1 liter. The dispenser releases portions from the base so all you need to do to start dispensing is hold it above where you want the mixture to pour and squeeze the handle. When you have dispensed the desired amount of batter, release the handle and it will stop pouring. When all your mixture has been poured, the dispenser is simply cleaned in soapy water and stored away until it is next required. Mix and dispense your batter with one tool! No wasted batter and less mess. Easily and accurately dispense cupcake, pancake, crepe, waffle and most other batters and sauces. Easy to read measurements on the side in ounces, cups and milliliters. 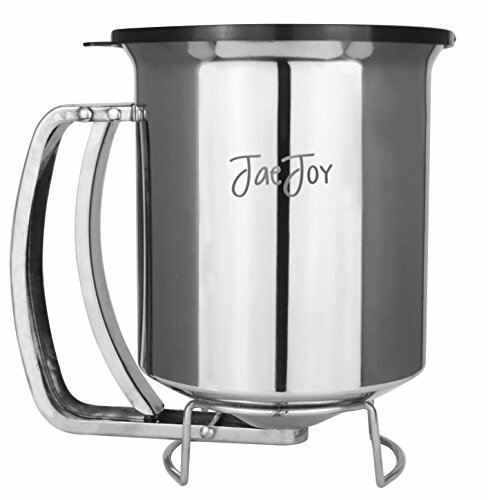 This is a batter dispenser made from stainless steel, so it should be tough and durable. It also has a slightly higher capacity than some of the others which means more pancakes and waffles for everyone! Apart from its usefulness, which we’ll come on to, the first thing to note is how aesthetically pleasing this dispenser is. 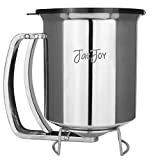 Obviously, the stainless steel helps, but the manufacturers have also given the handle and base design some thought and produced a dispenser that will grace any kitchen. It has a capacity of 1.2 liters so should be able to make more pancakes and waffles than most other dispensers which tend be one liter or less. There is a useful measurement guide on the side which has milliliters and cups to guide you when pouring. Dispensing mixture only requires you to squeeze the sprung handle and then release it when you have poured the necessary amount of mixture. Move on and repeat for each pancake, waffle or cupcake. If you have made more mixture than you need, rather than wasting the remainder, you can store it, thanks to the sealable lid. Place it in your refrigerator, and you can reuse it the next time you want to quickly make pancakes, without having to mix up new batter. It is also dishwasher safe, so it can be cleaned without you having to get your hands wet. Another dispenser made from stainless and again it has a very stylish design. This dispenser also comes with some very useful bonuses. Let’s talk about those bonuses first, shall we? Any pancake, waffle or cupcake mixture will need to be mixed and to help with this, a silicon spatula is supplied. This is also ideal for scraping out any excess mixture in the dispenser after use. If you want to try making cupcakes, then the six silicone baking cups are great for getting started. The third bonus is a crepe and cupcake recipe book with 20 recipes so that you are never short of ideas for delicious treats to make. Even with all these extras, they are not going to be much use unless the dispenser can pour out mixtures, and this it does well and without any drips or mess. Simply press the handle, and your mixture will pour from the base. 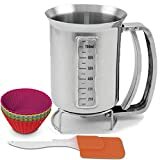 To help you measure both the batter as you are mixing it, or the amounts you are pouring, there are measurements down the side which are marked in milliliters. Finally, you’ll be pleased to know that the Utilwise Dispenser is dishwasher safe so it can be cleaned easily. 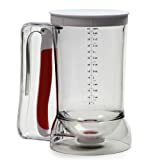 If you want the utensils and equipment you use to bake or cook anything to be as simple and straightforward as possible, you will love the Chuzy Batter Dispenser. This dispenser is a perfect size to mix your batter, so there is no need to use other bowls, which of course would need to be washed afterwards, so there’s a plus right away. To help you with the right amount of ingredients, there are measurements on both sides of the dispenser; one is in cups and the other is in milliliters. Once your batter or mixture is prepared, the next step is to pour it, and this is as easy as it gets. All you need to do is hold the dispenser above where you want the mixture to go, and then gently squeeze the sprung handle. Once the right amount has been dispensed, the handle is released and stops the flow. Cleaning the dispenser is a much simpler task compared to cleaning a waffle maker. Unfortunately though, it can’t be placed in the dishwasher; however, a quick rinse in some warm water will soon have it clean and ready to reuse for another recipe or be stored until next time. Hopefully, you love making cakes, pancakes and waffles as much as eating them, and therefore we hope our reviews of batter and mixture dispensers has helped. We recommend them all but we must choose one which has our highest recommendation and that is the Utilwise Stainless Steel Pancake Batter Dispenser. This dispenser looks great and will add a little bit of style to your kitchen. When in use, it is easy to dispense portions, and with clear measurements on the side you can be sure you are dispensing the correct amount of mixture. It’s dishwasher safe so there is no messy washing up, and finally, you get three great bonuses which include a silicone spatula, silicone cake holders and a recipe book so you have plenty of mouthwatering ideas for tasty treats for all the family.